Six studio albums in and Californian metallers DEVILDRIVER are showing no signs of slowing down – unless it’s to add a little extra groove of course. The band’s new album ‘Winter Kills’ strikes that perfect balance of the heavy and melodic with interesting lyrical topics such as metaphysics adding another dimension to the music. NZRock speaks to frontman Dez Fafara about the new album and exciting news that DEVILDRIVER will be heading down-under for the Soundwave Festival in 2014. The first single from ‘Winter Kills’ is ‘Ruthless’ and it’s sounding great! What is the rest of the album like in comparison? It’s a very cohesive record, it’s got lots of ups and downs and a lot of different places to go. It’s heavily groove laden and the nature of the arrangements are extremely tightened up on this record. You are going to get a lot of punk rock influence and a lot of live DEVILDRIVER feel from it because there was a lot of magic recording the thing. I mean most of the takes vocally are first takes, I didn’t spend three or four hours on one thing, I got in and got out which I wanted to do. I wanted to feel it, I didn’t demo any of the vocals on this record because I wanted the first time I put down those words to be stuck on the record. If you’re a DEVILDRIVER fan you are going to go wow and if your not a DEVILDRIVER fan we are going to win you over. And if you’ve never heard of DEVILDRIVER you might want to start with this record and work your way back into the catalogue and you will find out that everything we have done over the last five records has been different sounding but with our signature Californian groove sound. You mentioned doing things live in a take and there is also a live DVD accompanying the special edition of this release. what songs are on that? There are going to be songs from all the records. We got permission from Roadrunner to use some previous songs that are not on the new record. you are going to get a live DVD, live at a club, no overdubs. And I think it’s important for people to see that and know that we didn’t do any overdubs or anything like that and I think its good man, you buy the extra edition and you get a couple of extra songs, you get the live DVD and it’s a good thing to give some extras to people. The other thing i noticed you have two vinyl editions, one purple and red. Is it a big deal for you to keep releasing vinyl? I like vinyl, I just recently collecting it again this year and I’ve really found it to be a love of my life now. I mean I was out there this morning listening to my vinyl so its always good to give collectors some, then other people who don’t collect it can at least appreciate that we put it out. Going back to the song ‘Ruthless’, I really like melodic interlude – reminds me of MACHINE HEAD or even ‘…And Justice For All’ era METALLICA. Who came up with that particular chord progression? You know we have so many influences as a band that you don’t really know where anything is coming from. we listen to a wide variety of music from blues to black metal that the influence comes from everywhere and can just come up with it on the spot with different musicians working together. That being so, we just dont hone in on just metal, we try to capture some kind of moment in that groove it just comes out heavy haha! So will that single also be the first video off the album? There’s going to be a lyric video for it, were doing a video for a song called ‘The Appetite’ but the bands not going to be in it. We as a unit are sick of standing in front of the camera. We wanted to do something different so with lyric videos and also the video concept we have for The Appetite’, we’re not going to be in the video and I think its appropriate. We are going to let the music speak for itself rather than the image, the attitude and the cool lighting haha! Outside of DEVILDRIVER you’ve also done another musical project BORN OF THE STORM. Did any of that influence make it’s way onto ‘Winter Kills’ in terms of the grooves? I think everything I do is different, I love the process of art, I love working on new things and pulling different things out of the box. I mean COAL CHAMBER is different to DEVILDRIVER, and DEVILDRIVER is way different to BORN OF THE STORM. If you go to Youtube and listen to some of the BORN OF THE STORM TRACKS tracks I’m using a clean singing voice, its completely different. I like to come out of the box and do different things. I recently guested on the new CANCER BATS record as well as the new SOULFLY record so whenever you get time to work away from your primary project I think it adds to that project when you come back to it. You’ve mentioned the theme of ‘Winter Kills’ is rebirth, can you go into the specifics of that a bit more? I do love the rebirth of things, the way winter comes on and kills things off and in the spring and the summer there is rebirth. Thats why I had no problems with restarting the band after I left. I love the process of rebirth, planting the seed and watching it come up. 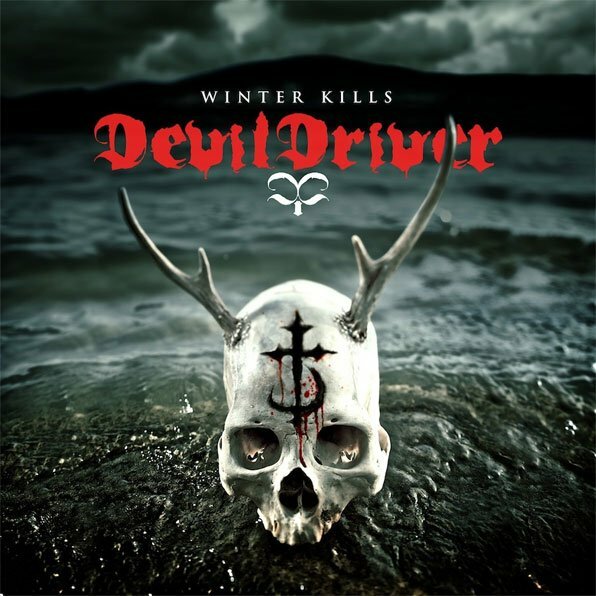 Also ‘Winter Kills’ for me was a name that said it was a killing stroke meaning this record is the killing stroke. You know we are obviously not in any scene but for the scenes around us and the fans around us I really want them to take note and listen to what we are doing and for me ‘Winter Kills’ said it all. The first track that I wrote was ‘Winter Kills’ and from there on it kept coming up so I knew that it was going to be the title track. What are your personal favourites off the album that we can look forward to? I really like ‘Desperate Times’, it really teaches you how to keep your head up and keep moving in the fight against adversity in your own life. I do love ‘Ruthless’, it says exactly how you have to be sometimes for yourself and your family to protect yourself. There are songs like the ‘Oath Of The Abyss’ which is the first track, its a longer track, almost a seven minute track for us. And it speaks about ritual that magic adepts take, one that I have taken you can actually Google ‘Oath of the Abyss’ to get a better understanding of what it is. We don’t have enough time for me to actually talk about it now but I’m going into different things in life and the metaphysical thought relationship, trying to get real deep with it. I know that the lyrics are going to be around a lot longer that I will in this lifetime so I’d like to leave something a little deeper and especially on this record. I’ve seen you wear t-shirts with hexagrams and other symbols, does that relate to an interest in the Golden Dawn and Occult? Oh definitely, I’m way into the Golden Dawn. I practice free masonry and the concept of that. I have been practicing magic for well over 20 years. My wife grew up in a family that practiced, ritual is a big part of our lives and I do understand a lot about and practice some things that the Golden Dawn do but I’m not too constricted by it. But to talk about magic now man, we’d have to have about an hour. You’ve mentioned that this album is huge on Californian groove, does that sets this apart from previous records? You are signed with Napalm Records outside of Australia and New Zealand is it cool having the opportunity to be a flagship band for this label. They have other big bands but very different in style to DEVILDRIVER. You know I’m a business man and I want to pick business partners who have passion especially when you’re dealing with art. You’re taking art and making it into a commodity. I don’t like turning my art into a commodity but the bottom line is it’s got to go further to get the music out. That being said you have to choose business partners that have passion. I stayed with Warner Bros/Roadrunner in Australia because they have passion for my music and they’ve got me a Top 10 record, they know what they’re doing business-wise. Napalm Records has the passion behind us now and I’m curious to see what they’re going to do. Working with them so far has been pleasurable and we’ve got to see where it goes. That being said, I’ve also signed with Metalblade for Japan because Brian Slagel is one smart guy and has passion for our music, and he’s going to help us to break DEVILDRIVER out in that market. So let’s hope that it all goes well and I’m putting my feet up for the ride. So how did you get onto your new bassist Chris Towning? Well he was working for us for a long time and he started playing for us. after living with him for a year I really love Chris, he’s an amazing player, he’s straight edge, he comes from a music background that I come from, he loves heavy stuff, punk rock stuff and he knows where I vibe with that. The guy is incredable live and he is a pleasure to live with on the tour bus so it was only appropriate that we make him a member and I’m proud that he’s part of the DD team. After the past issues with COAL CHAMBER and drugs, do you now have a zero tolerance for them in DEVILDRIVER? It looks like lots of touring for DEVILDRIVER during the next year including Soundwave in Australia. Does that mean we might see you in New Zealand? I would definitely love to, its a place that I’ve never visited, I’ve had one layover but that was it. I’ve always heard the people are great and the surf is even better. I’m a surfer so if I can come down and do a show and catch some good waves I’m in! We saw COAL CHAMBER over at Soundwave in 2012 and it was awesome. The band had one of the biggest crowds at that stage. Did you enjoy it? Thank you very much, we had a great time doing COAL CHAMBER. It was good to do it and the reaction was so well received all over the world, it makes me pleased we did it. You’ve got to understand that every band we’ve ever played with are the biggest bands on the planet. COAL CHAMBER took out SLIPKNOT on their first ever US tour for the first 2 months. We took out MACHINE HEAD in the US, SYSTEM OF A DOWN opened for COAL CHAMBER for four years before they had a record deal and so if we didn’t break up in such a horrible fashion, who knows what could have happened but lets not look at what we don’t know, lets look to the future and say hey look it was great to get back with COAL CHAMBER and do those shows but now I’m moving into DEVILDRIVER world and I’ve got to put all my focus on my baby.